ooking for the best handheld shower head? Wait no more with this list of shower head reviews! Well give you the full rundown of the top shower heads available on the market in 2019. After all, you can skimp in a lot of places, but you should never skimp on your shower. Life’s too short to live with low water pressure! Check out this list of ten great shower heads and make an informed decision on your next purchase. Delta’s Two in One Showerhead offers extra long reach and unique settings for a showerhead that is definitely worth checking out. It can be removed to use as a handshower, or just put back in its place for a regular shower. It comes in Venetian Bronze color– and because of that, many customers think that it is made out of metal. Delta’s showerhead is actually made out of plastic, disappointing for those who want metal but great for those that prefer light plastic. Shower arm and flange are sold separately with this model, but it comes with a UltraFlex hose that can reach 69 inches, so plenty of reach. It is a little expensive for a model that is made out of plastic, but the head is also plastic but looks like metal for a nice touch, and it won’t droop down while hung up for a shower due to its weight. It’s light and very easy to move or use, and comes with different patterns for spraying as well as a flow pause button, in case you need to pause the shower to grab something or just need to pop out to answer the phone! All in all, an adequate model that is pretty average. Delta’s Universal 7 setting hand shower is an awesome product that brings the luxury options directly to you. So many features and a high quality product make this a really great value purchase, and you’re sure to agree. One of the best features of this product is the massage feature. This feature will give you fast, slow, or full massage! Great pressure and feels incredible. The Delta Faucet also features One and full sprays, champagne sprays, and a spray that is energy saving. You can now shower so many different ways! This hand shower has a 2.5 G.P.M. flow rate, steady flow, and a flexible hose that is 72 inches, so plenty of reach. With a chrome finish, this shower head looks nice, too! 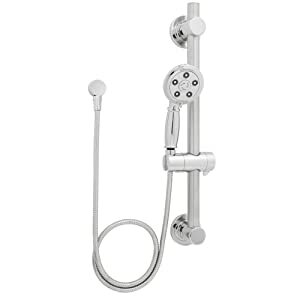 It has a shower arm that can be mounted to shower hands free, and has a spray dial that is easy to turn. Anti-clog gets rid of mineral deposits before they start, and this model has an ergonomic handle that’s really fun to use. This shower head can be installed very quickly, too, taking only a few minutes. Comes with an internal waterway for great performance and trickle setting if you’re washing your hair or loofahing to save you on water. The PowerSpa 3-way LED showerhead sure is a fun way to shower! Now you can lend a little excitement to your shower with this high quality shower head. This product doesn’t even need batteries to operate– it’s charged by the running water! Its Air Turbo technology makes water pressure better than ever, putting oxygen into the regular water flow to give you more power and help you save on water. More than just a color changing shower head, each head comes with a total of four settings: massage, rain, rain/massage, and water-saving (economy). Not only does this shower head change colors, it changes through seven colors! Every few seconds, you get a different color! It’s such a fun novelty– you’ll definitely feel like you’re in the club. Not only does this shower head come with cool effects, it can be used as an overhead or hand held shower. Comes with 3 zone dial, 3 way water diverter, a five foot stainless steel hose, and is easy to install, always a plus. The Ana Bath handheld showerhead is self powered by water and doesn’t need batteries to show off its cool LED feature! 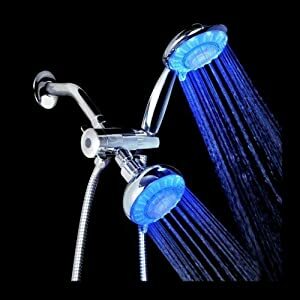 Not only do you get the benefit of having lights in your shower, the LED comes with a three year warranty, and a lifetime warranty for the rest of the parts. Upgrade your shower system with an easy to install shower head! Take advantage of the water saving technology of this shower head and save money while being eco-friendly. This shower head features a chrome plated finish, which looks very nice but doesn’t have the heavy weight that real metal shower heads do. 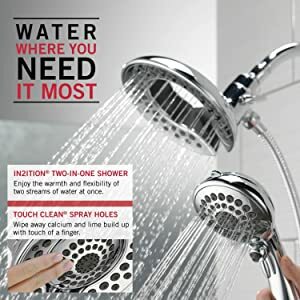 This shower head also has luxurious features with five functions– saturating, massage, and bubbling spray, with combinations of saturating/massage spray and saturating/bubbling spray. This showerhead features a three way diverter mount and shower hose as well. 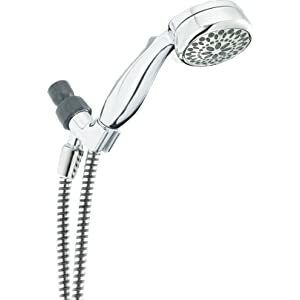 This shower head is four inches in diameter, chrome finish, and has a three functions in it. Users may be discouraged by the fact that it comes without instructions, but those who have installed shower heads before will likely be fine. This shower head is good for the environment and features Eco Performance to make your shower more enjoyable due to the fact that it’s environmentally friendly! Users of the Moen shower head will likely appreciate that fact when they look at their water bill for the month. The end mounts are plastic, which may be a drawback for some buyers. The Kingston brass vintage leg tub filler with hand shower combines the best of both worlds! Now you can fill up your tub quickly without having to wait for regular slow moving water to come out. Users will love this vintage filler because it fills your tub up fast without bubbling or flowing out eccentrically and does so nearly silently. This does mean, however, that users will have to keep an eye on their tub since it fills it so quickly in order to avoid overflowing their tub. Many users are used to turning on the tub and walking away– don’t do that with this product! Comes with tarnish and corrosion resistance and a vacuum breaker to prevent backflow, this product is constructed out of brass and brushed with polished chrome for a nice, modern finish. Hot and cold are labeled on elegant porcelain handles and it comes with disc cartridge as well. Great for those who are seeking a combination tub filler and hand shower that looks nice and even relatively vintage in nature, with all the benefits of a modern fixture. 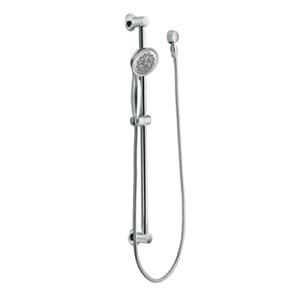 The Mariner 2 Chrome Hand Held Shower Combination comes with dual shower heads! They come with three adiustable position sprays and feature a heavy duty Chrome hose– 59 inches– that will not crimp. The hand held spray can so up or down and the head will tilt in any position. 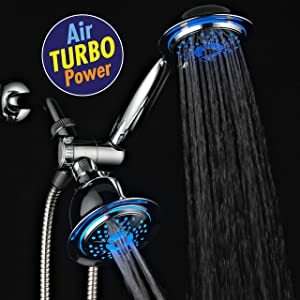 Users liked this shower head but did not like that the head did not swivel and stays fixed and that it does not come with an on/off shower handle. They did like the power of this shower head and the fact that it comes with a sturdy bar that is adjustable and made of solid brass. The bar is 24 inches. Great for a family! If you’re looking for a functional showerhead that has a nice appearance too, the Speakman shower head is for you This shower head comes with a curved slide bar that you can adjust and a showerhead that can be handheld too. This showerhead is strong and uses high quality engineering for a mounting system that will stay in place and is easy and quick to install. 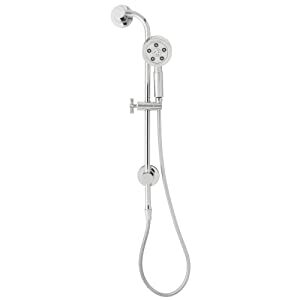 It has a modern design to the shower head and will work with any valve that’s already in place. Comes with a four inch metal hose, neo hand shower, and a flow rate of 2.5 gpm. Users can adjust this shower head to any height that they please. Comes with design curvatures and the hose will not tangle! This shower head is perfect for those who want a mixture of elegance and convenience. The Speakman handheld shower head comes with a 360 degree spray that lets you get the luxurious shower you want and deserve! The faceplate can help you adjust the spray and the model comes with a sixty inch shower hose made out of metal with a vacuum breaker built in The slide and grab bar is standard U.S. plumbing model so should be an easy installation. This shower head looks very nice and sleek thanks to the polished chrome look. 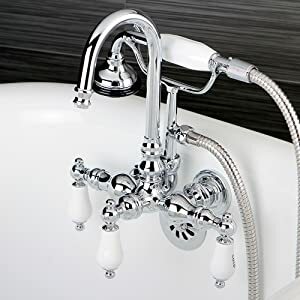 Comes with a handle and shower head, but you’ll need to get the shower head piece that sticks out of the wall– many users won’t be interested because of that alone. Still, this shower head is functional and gets the job done. You can use full force spray for the high pressure shower you want or just get the central pulsating massage(or a combination of the two). This shower head has a patented system that pushes out water with more energy, giving you great showers with excellent pressure that result in a spa like feel. Matches with other Speakman accessory sets for the bathroom as well. This shower head is able to be adjusted for both height and angle. It has three functions: aerated drench, regular, and massage. Comes with a metal hose that is 72 inches in length, and has a slide bar that is 24 inches long. This shower head allows for a flow rate of 2.5 gallons a minute at 80 per square inch. This is a very basic hand shower that is efficient but will allow you to take the shower that you want. Users did complain that the bar was not 24 inches fully, so if you need a bar that is exactly 24 inches, you may want to keep on looking. Users did like the versatility and appearance of the shower head, which looks very nice with a brushed chrome aspect. Will work very well and allows you to select the type of shower you would like. Sturdy shower head and will adjust to accommodate a variety of heights for many purposes(taller guests, children, babies, and even pets). While there are certainly many reliable shower heads to choose from, it’s important to pick one that will last and also fits your style, preferences, and life! If you like something flashier and want to inject some fun into a daily routine, the LED shower heads here will definitely help you accomplish that The PowerSpa is a very attractive model when it comes to LED shower heads, mainly because it has seven colors but also four very nice settings, including one that is economical. However, the Ana Bath model has its own settings too, which are different from the PowerSpa’s. It’s really about what you prefer. For tub fillers that are also showerheads, the Kingston Brass tub filler is the way to go. It’s a good pick for parents who don’t have time to wait for baths to fill up or just adults who take more baths than showers. 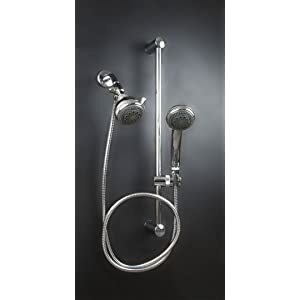 If you’re looking for something basic but functional, the Danze Three Functino Hand Shower, Mariner 2 Chrome, Speakman Neo, and Speakman Alexandria Anystream are good choices that don’t get too complicated or fancy. Then again, if fancy is what you’re looking for, the Delta Faucet shower head has a great seven settings that are the epitome of luxury. With great pressure and fine, strong, eco, champagne and massage sprays, you’ll look forward to taking a shower every single day. The Delta In2ition is average, and lacks the fancier touches that the Faucet proudly displays. Lastly, the Moen Envi Eco-Performancegives decent luxury while still being economically minded. It only comes with three functions, but that still may be more than your current shower head! This model is great for users who fret about their water consumption and want to be more green. here you have it! Some of the best handheld shower head on the market. Each of these models has its own attractions and benefits, so it’s important to carefully look through and evaluate what model would be best for you. Take your time and look at what’s most valuable to you in a shower head. Whether you’re searching for luxury, multiple settings, water pressure, certain materials, green features, fun, or practicality, there’s something for everyone out there. So get shopping, and good luck! Previous How to change the diverter on a shower head?